21st Century Fox is awaiting regulatory approval on a $US52.4 billion deal with Disney. The remainder of the company should create a “cash machine” that would help Fox make more deals, an RBC analyst noted. View 21st Century Fox’s stock price in real time here. Once 21st Century Fox relinquishes its cable channels, television studios, and other associated assets to Disney in their $US52.4 billion deal, the remainder of the company should create a “cash machine,” a Wall Street analyst noted. “SpinCo will be significantly cash flow positive,” RBC Capital Markets analyst Steven Cahall wrote in a note to investors. Cahall believes the new tax law will shield Fox from about $US1.5 billion of annual taxes for roughly the next 15 years. The leaner Fox will have an estimated $US3 billion of 2018 EBITDA, and it will be free cash flow positive thanks to the tax shield, Cahall notes. Additionally, Fox will get an extra boost from the Disney deal because the terms of the transaction will reduce its debt profile and interest expenses. Fox’s $US13.7 billion in net debt will be assumed by Disney, while Fox’s tax liability will be paid off by a dividend of between $US6 billion and $US6.5 billion to Disney shareholders. Cahall was also optimistic about the news that Fox will have the rights to Thursday Night Football, which should bring in $US600 million per season. As mega tech companies like Amazon and Facebook increasingly encroach on the traditional media industry, the freed up money could be used for new deals to protect Rupert Murdoch’s media empire from the competition. According to CNBC, this was one of the reasons why the Fox CEO agreed to the Disney deal. “This should give new FOXA plenty of options around M&A and/or capital returns, which we think could include accretive station acquisitions and buying digital assets to complement Fox News,” Cahall said. 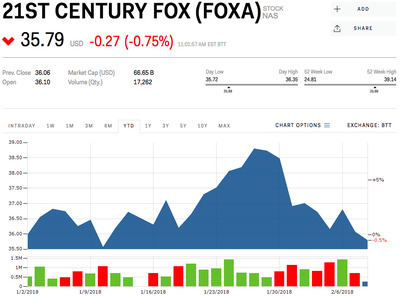 Fox’s stock was trading at $US35.82 per share, down 0.5% for the year. Read more about how Netflix, the video streaming company that everyone wants to top, is staying ahead of its competition.